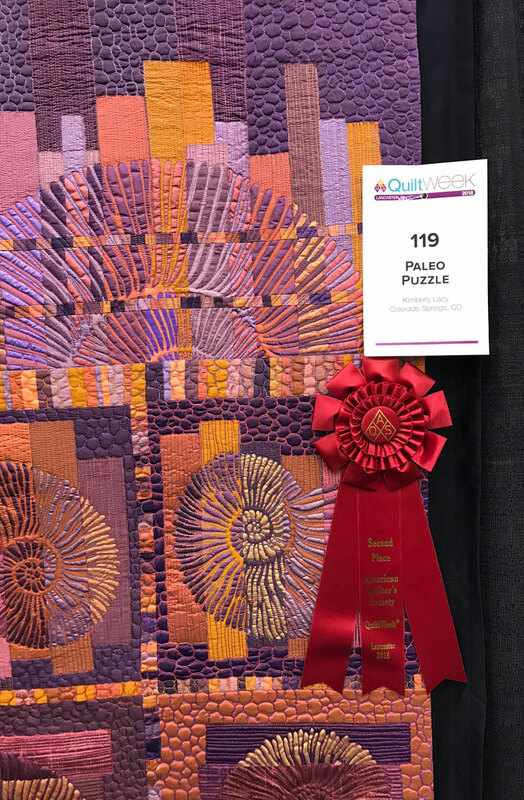 I visited the AQS Lancaster Quilt Show yesterday and it was certainly an inspiring day after all this crazy snow! It was wonderful to get out and see all the gorgeous colors and fabrics. You can see the list and pictures of winners here and they are certainly well deserved. The workmanship is beyond amazing and absolutely stunning. Those quilters must have spend months without seeing the light of day. 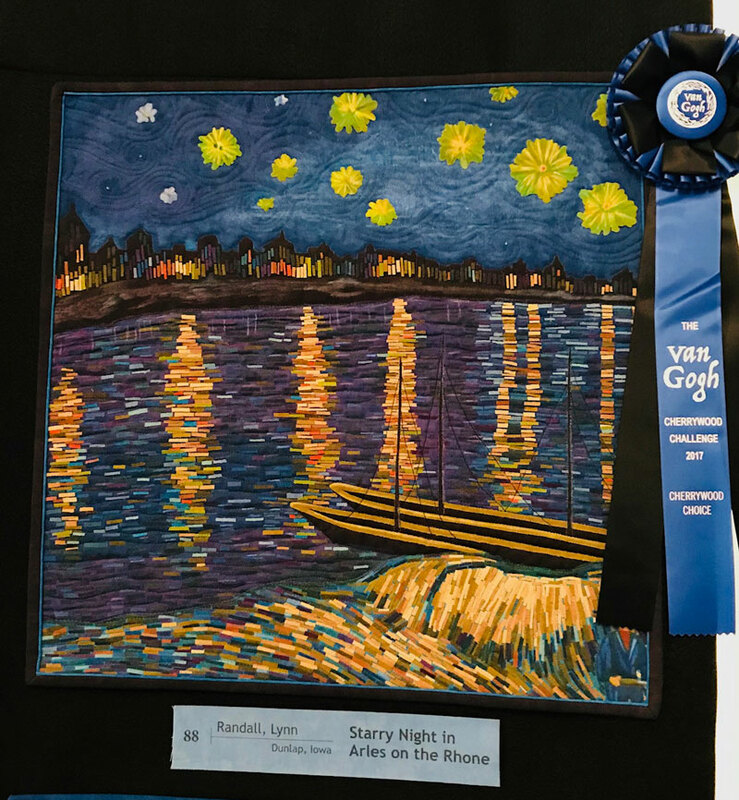 Quilters work harder to make their art than artists of any other medium, I think. 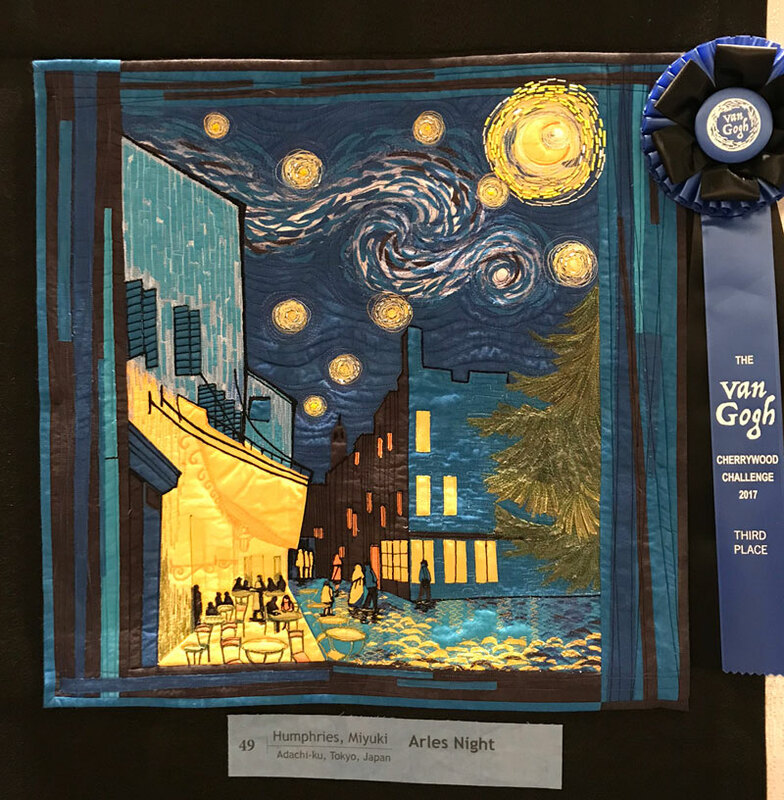 My favorites were among those found in the Cherrywood Van Gogh Challenge. They were the most creative, delightful, and compelling thing I saw that whole day. This last image gives you a perspective of the scale of this exhibit. Each quilt is 20″x20″ and must use Cherrywood fabric. 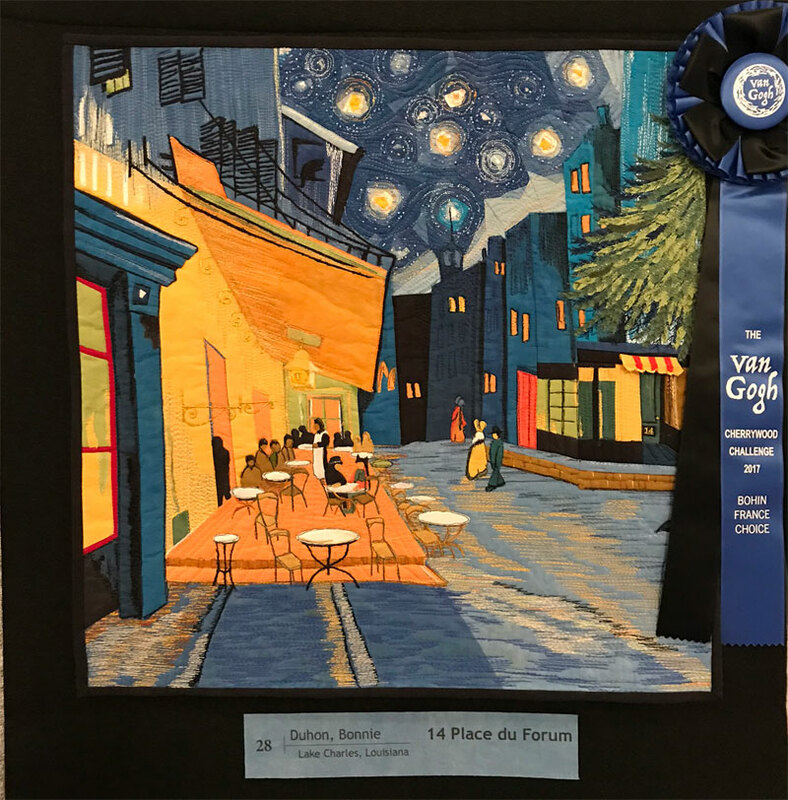 The colors of this challenge are that luscious Van Gogh blue and gold so they are just an absolute feast for the eyes. Next year’s challenge is “Prince” and will, of course, be predominantly purple. If you’re up for the challenge you can purchase your fabric packet and read the rules here. Other highlights? There were so many! 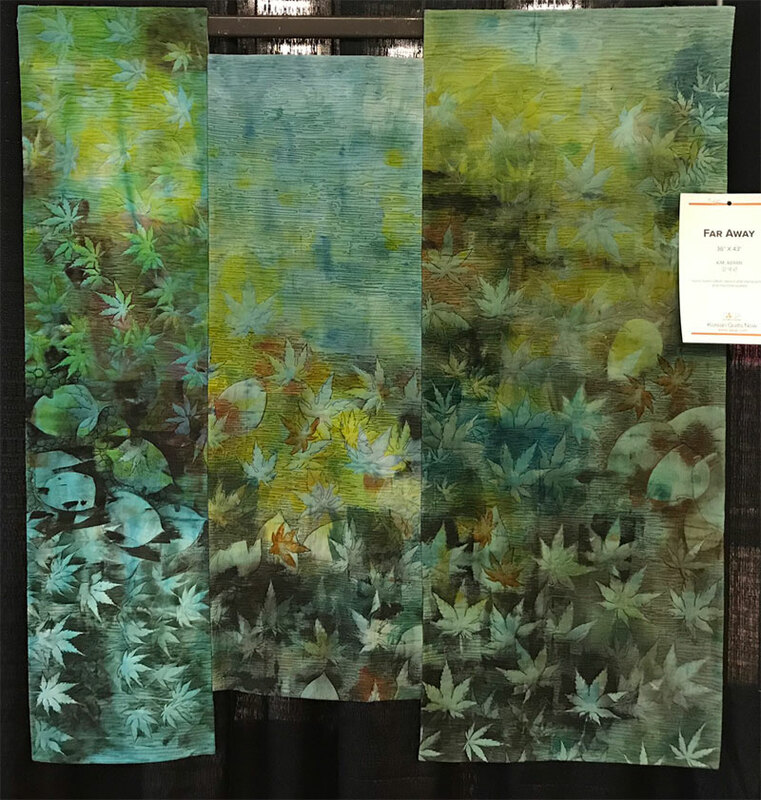 This quilt from Japan caught my eye with it’s lovely design and use of kimono fabric. Those maple trees and shrubs through the round window? All microscopic bits of what looked to be yarn or wool covered with netting and stitched to death. Absolutely gorgeous! 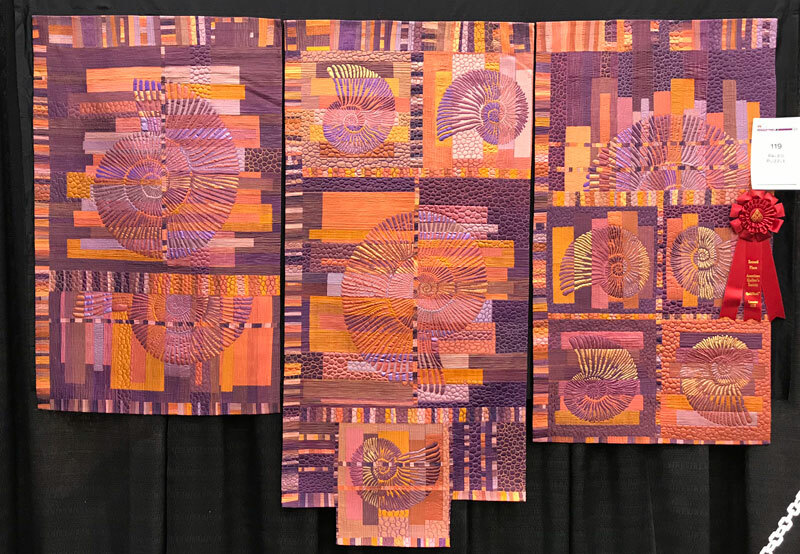 This quilt is all silk with metallic paint screened onto the surface. 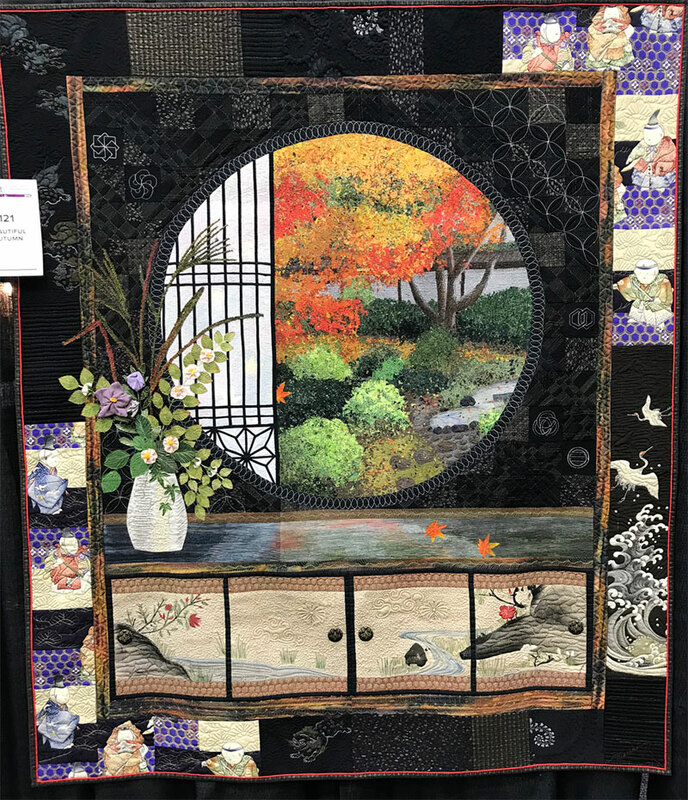 The quilting is stunning and I love the design and colors. 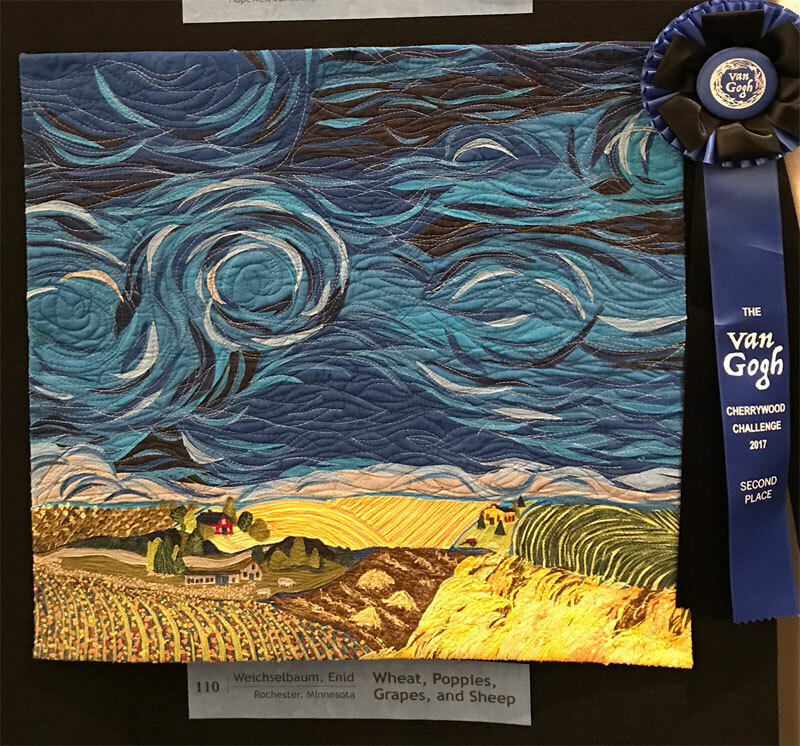 She uses thread to create shading and texture. Just lovely. This quilt was hand dyed then stenciled and stamped with paint. I thought this was just beautiful. 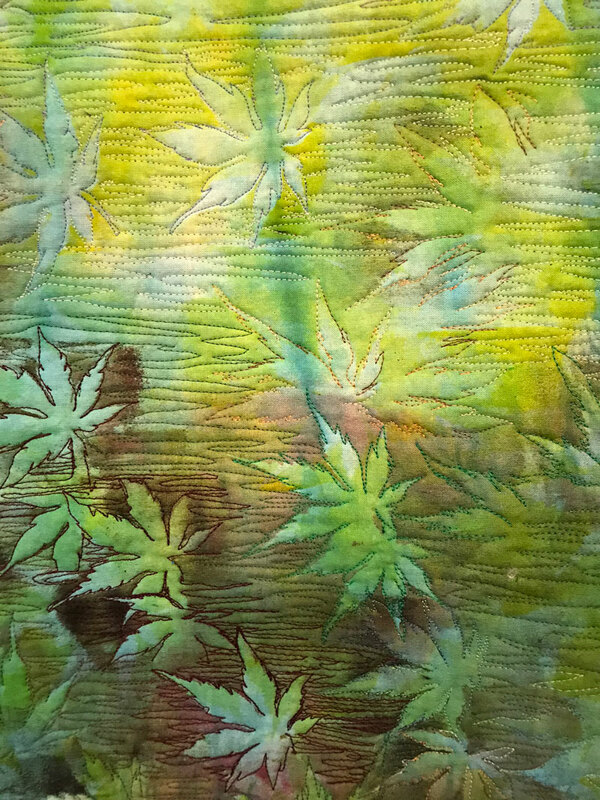 The colors were just dreamy and the quilting made those leaves just pop. One last bit of fun. 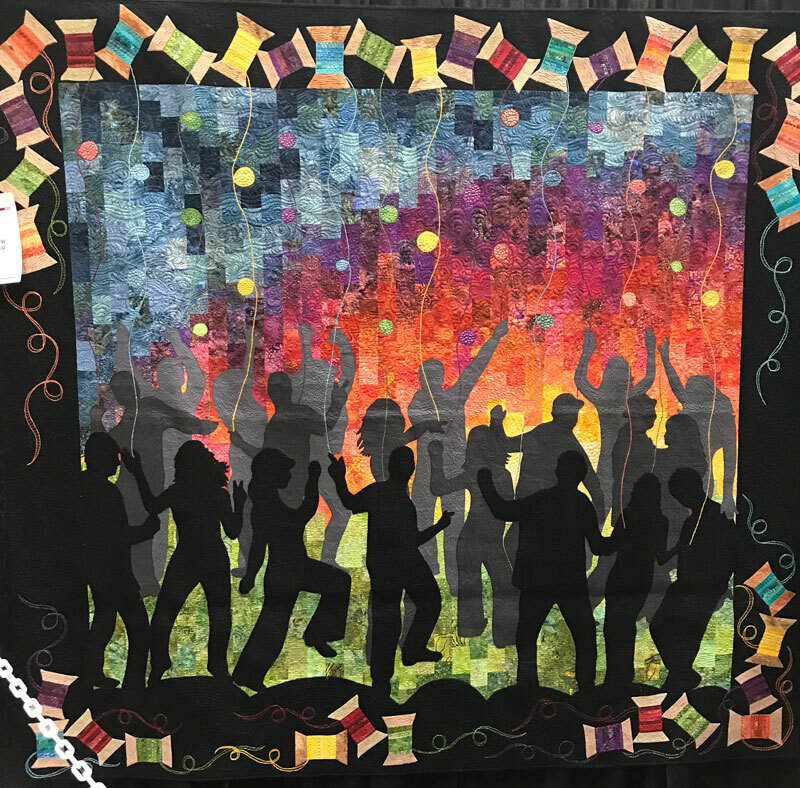 This quilt was so playful with all the spools of thread in the border. Look at how she created depth by using three different shades of black and grey for the dancers. The “thread” coming off the spools and down across the scene was actually couched yarn. This was great use of color in the pieced background, too. Of course we visited all the vendors and bought lots of fabric. You’ll be seeing more on that later. The show runs through tomorrow so be sure to go if you’re in the area. Also the Cherrywood show is a traveling show so check out their schedule. Don’t miss it! 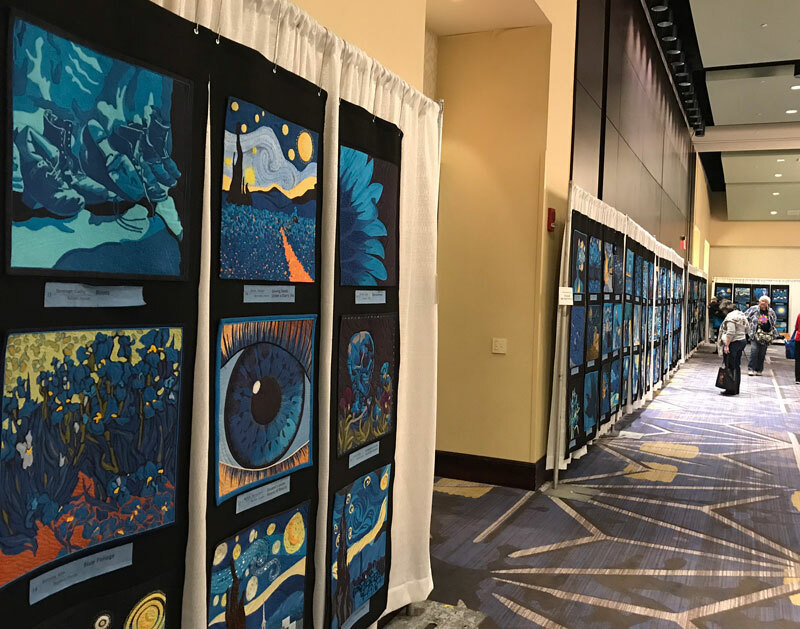 The talent and determination shown by all these quilters is simply astonishing, isn’t it?